Members of marginalised groups are so often thought of in terms of the monstrous. Our lived experience, our appearance and presentation, our relationships, our cultures, our love — all of these things are made into horror by oppressive attitudes. Similarly, there is a particular narrative so intrinsic to the idea of “heroism” that we no longer analyse whether that person does good deeds — instead, their association with the hero narrative justifies them retroactively. This manifesto calls for the continued analysis, complication, subversion and reclaimation of these convenient narratives. In a cosmogony where good and evil (and even moral neutrality) are objective physical forces, they effectively become nothing more than factions with different tastes and traditions. Good and evil becomes an aesthetic choice. Certain uncomfortable grey areas of morality are then associated with n/either faction, which potentially means that spheres of human interaction are taken to difficult and/or ridiculous places. Skin colour displays morality, Anglicised names tend to be more on the side of “the good faction” than all others. Real world accents become associated with monsters. The grid of Lawful-Good to Chaotic-Evil is a simplistic tic-tac-toe game that has been brought to a state where nothing further can progress and neither side can win. It’s time for more interesting scales of character morality. This manifesto, alongside The Slow Games Movement, was created as part of the Manifesto Jam, February 2018. 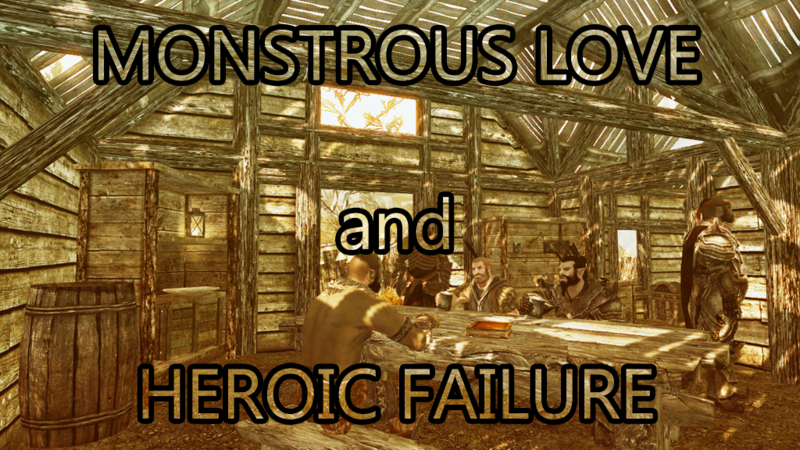 Monstrous Love and Heroic Failure was also exhibited as part of the Manifesto Jam selections at Now Play This 2018.